Bellairs for the new millenium. Warren lives and works in his family's hotel, just as 12 generations of Warrens did before him. His father is gone, but his Uncle Rupert and Aunt Annaconda run the hotel... which never has guests. When a mysterious, silent figure wrapped in bandages books a room, the hotel is suddenly besieged with guests, all of whom are looking for "the all-seeing eye". Each person has a different concept of what this is, and Warren's family doesn't seem to know. Annaconda's sisters, Scalene and Isoceles, come to visit, and Warren suddenly finds himself on the receiving end of Annaconda's wrath-- she is a witch, and she wants the eye for herself! Luckily, Warren is aided by young guest Petula as well as Mr. Bunion, the cook and Mr. Friggs, his tutor. What family secrets can Warren uncover that will lead to the solution of the mystery? Hotels with creepy relatives and mysterious guests? Yes, please! If you enjoyed Milford's Greenglass House or are lucky enough to have the works of the incomparable John Bellairs at your disposal, Warren's tale will be one you will enjoy. 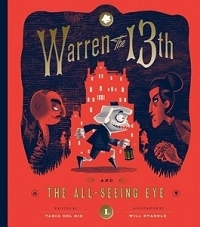 For readers who can't get enough Lemony Snicket read-alikes this is a great choice, made even better by exquisite formatting in deliciously creepy tones of red and black.The wider-than-normal pages have the text in two columns. There are line-drawing page ornaments add to the macabre feel of this book.